It's time. By mid-February, I'll have a new Supermicro SYS-5028D-TN4T mini-tower to tinker with for a bit. Since word got out last November, perhaps you've been patiently waiting for this 2nd wave to arrive, of the beloved Xeon D-1500 SoC (System on a Chip). This article gives you a summary of what to expect. The 12 core processor model may be called Xeon D-1557 or Xeon D-1567. The 16 core model will likely be called the Xeon D-1577. 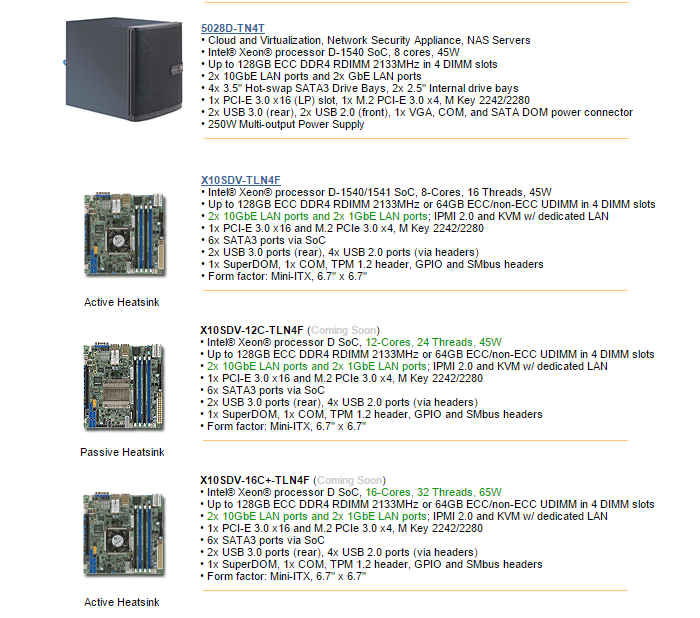 5028D-TN4T chassis, X10SDV-TLN4F, X10SDV-12C-TLN4F, and X10SDV-16C+-TLN4F motherboard specs. Note that all 3 have the same motherboard features, only the pre-installed soldered-on CPU specs vary. Intel Xeon D-1540 gets 5% speed bump as D-1541 with SR-IOV in a Supermicro SuperServer Feb. 2016, comparison with Core i7 6700K (Skylake), should I wait? I also plan to do some thermal testing of my various SSDs, should be fun! Video and Audio sped-up 4X, showing Samsung SSD 950 PRO M.2 NVMe during initial power-up. You'll even hear the BIOS speaker beep at the end of POST.